In a corner opening, in response to the approach move of , or a nearby move is a pincer, because it "pincers" the approaching stone from the other side (the Japanese term ハサミ hasami is noun form of verb hasamu, which means "put something in between, sandwich"). The pincer is an attack on , and prevents the attacked stone from forming an ideal base. See pincer nomenclature for detailed discussion. 3-5 point 3-3 approach pincer. 3-5 point high approach pincer. the missing pincer: two-space low pincer after 3-4, high approach. 3-6 point pincers: mostly seen in amateur go. zero-space pincers: up close and personal. prevented Black from making an enclosure, and then prevented White from making a base on the third line. White would like to extend at least to . A three-space pincer at a would allow White to extend to b, which is a cramped short extension. White now typically played in an open corner, satisfied with having prevented a black enclosure. Later, people realized that Black need not hurry to attack . If Black played in an open corner and White extended from to make a base, Black could make an enclosure in the other corner, which was better. Even later, people realized that White did not have to hurry to prevent Black's enclosure, but could play in the top left corner in a way that worked with a later kakari at . 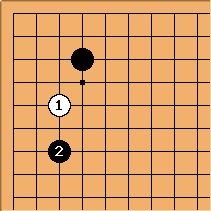 If Black made an enclosure, White could play first in a third corner. Such realizations were the beginning of fuseki theory. As a novice, I only feel comfortable making a pincer move when the group that my opponent is attacking is fairly strong, as this diagram shows. Otherwise I prefer to make an extension or attachment. I took the liberty of rearranging your stones a little, to make it look more conventional. Note that here is actually a very bad move; this move hardly improves on passing because the stone is so weak. 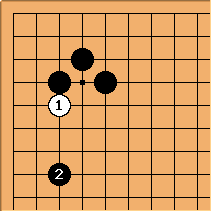 Going back to the first diagram, remember that White also has a one-stone group left. It will be almost automatic that either the corner or the pincer stone becomes strong while White is settling her own stone. Bob Myers: This example should probably not be here on the pincer page because it's not really a pincer. It's just an example of punishing bad play. unkx80: I think so too. I tend to view as an extension rather than a pincer. Adamzero: When I pincer my rationale is this: a) by squirming, my opponent will hopefully let me solidify my corner territory in sente b) prevent my opponent from settling, and by chasing him out in the center build territory and/or influence/thickness.